Two lasting impressions from my previous visit a year earlier were (1) the large number of unfinished high-rise structures, and (2) the massive vehicular congestion. I wanted to advise the planners to plan less for more highways and petrol-powered cars to fill them (which is what they were doing) and more for pedestrians, bicycles, and public transport (especially by electrified rail). I needed a way to offer this advice without just focusing on negatives like climate change. The argument I presented is summarized below. In the early part of the 20th century the growth of the automobile industry in the US, led by Henry Ford, was a huge “win-win”. Automobiles and buses rapidly replaced horses for urban transportation, thus eliminating a huge source of pollution (horse-manure) that had to be cleaned up and removed every day. Moreover, the elimination of horses eliminated the need for grain to feed the horses, which required around 25% of all the farm-land at the time. The land not needed to grow feed for horses could then be used to grow wheat and other crops for export – another benefit. And, as the city motorized, so did the farms. The automobiles burned gasoline, from petroleum, but huge petroleum discoveries occurred in Texas, in 1930. This drove the price of oil down to $0.10 cents a barrel – well below cost – until the government (it was called the Texas Railroad Commission) stepped in to limit production and to drive prices back up. But there were no horses (or horse manure) in Chinese cities in 1950. The building of roads did bring transportation costs down – helping the factories – but new roads became clogged with cars and trucks almost from the beginning. Why? Because China is densely populated, and building new roads, or widening existing ones, required demolishing lots of existing houses. This was a slow process, so new highway capacity could never catch up with demand. 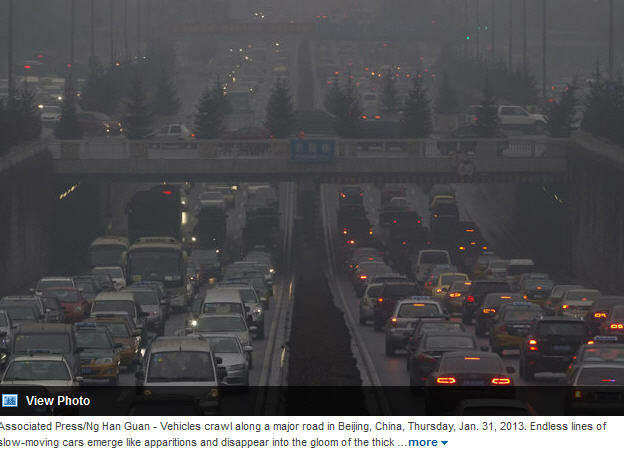 Hence even the newest highways were always congested. Congested roads are less efficient – traffic moves slower — than uncongested roads. As a result, the vehicle engines are always operating inefficiently, in stop-start- conditions. This causes air pollution and smog. Moreover, building new multi-lane highways involved paving over valuable farmland that had formerly provided food. Of course, new high-rise housing for the displaced people was built, but usually outside the central city, so the workers had to take long bus rides on congested roads to their jobs, sometimes 3 or more hours per day. Unlike the situation in the US a hundred years ago, petroleum is not flowing out of the ground. China is not self-sufficient in petroleum, and never will be. The South China Sea has some oil under it, but not enough for a rapidly increasing car population. Petroleum must be imported from the Middle East, or from Mian Mar, at considerable cost. Russian oil is also located far away, and transport for long distances by rail or by pipeline is expensive. (The US, by contrast, imports oil from Canada, Mexico or Venezuela, all of which are nearby). Adding more cars in a country with congested highways will increase the congestion, increase the air pollution, and increase the demand for petroleum from far away. Not only that, it hastens the buildup of carbon dioxide in the atmosphere. That buildup is the direct cause of climate change. Unlike President Trump, the Chinese leadership has recognized this fact and has started decommissioning coal-burning power plants and shutting down coal mines. But, up to now, the Chinese leadership regards the automobile industry as a powerful industrializing force. 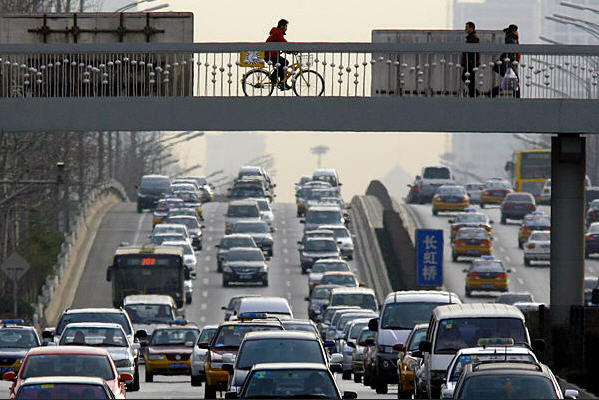 Of course, every person in China – like every American — would like to own a car and wants to drive it on uncongested roads. But the government, and the planners, have unfortunately encouraged this impossible dream. It is a bad mistake. The future needs plenty of infrastructure investment, but not more cars. I will discuss the alternative future in another post. This entry was posted in 2018, Cars, China, Environment and tagged 2018, Ayres, Cars, China, Environment, Op-ed. Bookmark the permalink. ← REPUBLICAN TAX POLICY: A cruel scheme to cut social security while gorging the military-industrial complex.